Known to everybody in the paddock as ‘Colonel Joe’ following his illustrious United States Air Force career. 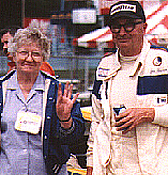 Won his first SCCA National Championship at the Runoffs at age 55, and as of September 2003, was still a viable threat to win the Runoffs at age 84. Competed in the Runoffs every year between 1969 and 1996. Four-time Runoffs National Champion. 1974 in G Production in a Sprite; 1976, 1981 and 1982 in a G/P Datsun Spl. 311. Bought his first sports car, a MG-TD in 1953 while on duty in Germany. Began racing in 1964 with his Sprite, then became the Dean of racing vintage Datsuns in a high-tech world. 4-time Washington DC Region champion in the 1960s. SCCA Northeast Division champion 22 out of 29 years between 1969 and 1997. Went into semi-retirement in 1997 after he and his late wife, Lois, were seriously injured in a highway accident, but unable to stay away from racing forever.